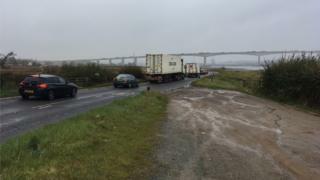 A van driver has died after he was hit by a tractor on the Orwell Bridge in Suffolk. The crash happened at 06:45 BST when the van broke down and stopped on the carriageway. The driver was out of the vehicle when he was hit and he died at the scene, police said. The road has been closed eastbound near Ipswich between Copdock and Wherstead. Suffolk Police is asking drivers with dashcam footage to come forward as it investigates the collision. "We're dealing with a two-vehicle traffic collision, we have got considerable tailbacks," said Sgt Julian Ditcham. "The closures are at Copdock, J55 but all vehicles are being put off the A14 and through the centre of Ipswich. "We're in the process of turning all the vehicles round and getting them off at Wherstead between the collision and the Wherstead off-slip."